I am a reluctant bird nerd. This is a recent development. I grew up in a neighborhood in Texas famous for birding, but the hobby was reserved in my mind for retired winter Texans escaping the Great White North. But I love natural history, and birds are the easiest and most reliable wildlife to observe, so gradually I have found myself growing to love the little creatures. Juvenile golden eagle (Aquila chrysaetos). Jim Watson. But I am also a planner. All of my weekends for the rest of the summer are planned out. That’s why I’m a Program Coordinator for the American Alpine Institute - I love to be able to look forward to what’s ahead, and I love it when all the details fall into place. 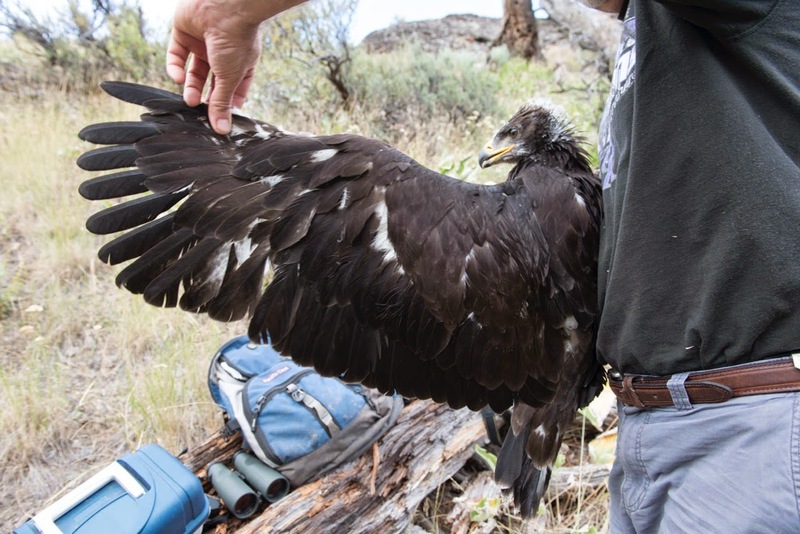 So when one of AAI’s senior guides, Alasdair Turner, called me last Thursday morning and asked if I wanted to help him and the Washington Department of Fish and Wildlife (WDFW) band and radio-collar golden eagles in the northeastern corner of Washington, I actually hesitated. I would have to take off work on a moment’s notice, make the six-hour drive that night after work to meet them in the morning, and I was already planning to do some climbing in Mazama that weekend. And then I snapped out of it. We were talking about golden eagles. Of course I wanted to help. Golden Eagle Crew with the giant net. Jim Watson. So my partner Chris and I packed up our things and headed out to a beautiful lake in Eastern Washington, where we met Alasdair the next morning along with Jim Watson, WDFW’s statewide raptor researcher, and three others who jumped at the chance to help out just like we did. Jim has been studying raptors for over forty years, and his love of the animals is obvious. Alasdair got involved four years ago when he responded to Jim’s call for an expert climber to volunteer with his research. It’s a rare chance to be able to work with wild golden eagles - they’re best left alone, and they’ve been known to abandon a nesting site when people (often climbers) accidentally or on purpose get too close to a nest early in the breeding season. After wavering back and forth over the drizzle, we bushwhacked through wet brush around to the back side of the lake, where we found ourselves unexpectedly navigating canyons and talus fields beneath tall cliffs. We could see the eyrie in a formidable-looking cliff, and through our binoculars we could make out the brown lump of a young bird in the nest. His feathers were mostly developed, but we could still see wisps of white down beneath the dark brown adult plumage. The parents were absent - probably off coursing the open hillsides for ground squirrels, marmots, rabbits, and the occasional fawn. Across the way on another cliff we could see an old nest - golden eagles often build multiple nests and rotate through them. View of the canyons near the eyrie. Hillary Schwirtlich. Alasdair geared up while the rest of us positioned ourselves where we had a good view of the valley. He planned to hike to the top of the cliff and rappel down from natural anchors to the nest, carrying a comically large net and a cloth bag with a padded board to hold the bird. We were there in case the bird took one look at the man climbing into his nest and jumped. We’d have to keep an eye on where he landed and make sure someone could get to him. Chris watching Alasdair rappel into the nest. Hillary Schwirtlich. Which, of course, is what happened. Before Alasdair could catch him in the net, the bird hopped to the edge of the tangle of sticks that was his home, spread his wings and jumped. I can’t imagine the landscape of that eagle’s mind at that moment. Soaring powerfully and masterfully through the air - this is something only a tiny fraction of life can do, and golden eagles are made for it. And this bird was realizing that he could fly and feeling how it felt to fly for the first time in his life. It’s not something I will soon forget. Jim Watson directing the group. Hillary Schwirtlich. Eventually after a long, slightly shaky glide, he came to land on a talus field. Alasdair chased him down at lightning speed and brought him back to where we were at the base of the cliff. Then we assisted while Jim gathered all the data he needed. 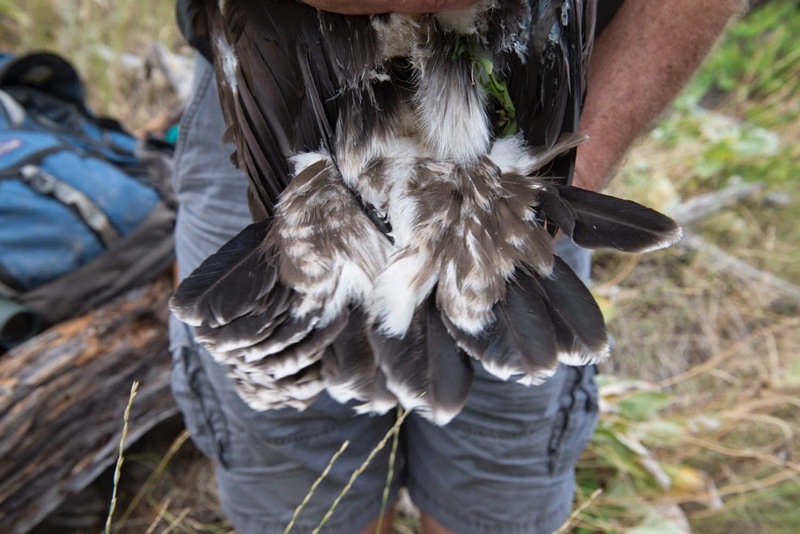 He banded the bird, measured the beak and the feet and talons, which were so terrifying when flexed, I found them hard to look at. He took a blood sample and measured the amount of fat under the wings, weighed him and measured the length of his tail and wings. Then we helped to put a radio transmitter on the young bird - a feat involving letting the bird spread its wings, which seemed impossibly long at such short range. Jim Watson banding the eagle with Anne Marie's help. Hillary Schwirtlich. All in all we found a healthy, feisty, well-fed bird - a good sign, given that the species is a candidate for listing on the Washington state endangered species list. Their numbers have been declining in recent years, and although the reasons are unclear, encroachment by humans, habitat change and a decrease in prey availability (especially jackrabbits, which use to be wide-ranging across the state and are now all but nonexistent) are suspected. Lead levels in the birds have also been high, sometimes even reaching levels suggestive of toxicosis, possibly as a result of ingesting spent bullets. Jim’s research, which started in 2004, has been centered around tracking and monitoring the species so that steps can be taken to maintain a healthy population of golden eagles in Washington State. After the data was collected, Alasdair climbed back into the nest and replaced the bird, and we hiked out. Alasdair, Jim, Chris and I then headed to another eyrie farther west in a drier part of the state, where we repeated the process, dodging cactus and rattlesnakes on the way. Rappelling into the nest was more complicated this time, and Alasdair had to deal with less-than-ideal anchor placement, a nest that required some maneuvering to get into, and loose rock at the top. It was a situation, he said, not many climbers would feel comfortable in. Once again, the bird jumped and landed on a talus field below, and Alasdair and Chris chased him down. At the second site. Two nests in the middle of this picture. Jim Watson. I held the bird this time, and although younger, he was feistier than the previous eagle - Alasdair named him “Mr. Bitey.” But after putting a falconry hood over his eyes, he instantly fell asleep. He had the birdy smell of a chicken, and had the weight of a small newborn baby, even though he was much larger and a couple months old. Then Mr. Bitey was placed back in his nest and we were on our way. The tail feathers of the second bird were less developed. Jim Watson. The wingspan of an adult golden eagle can reach 6 - 7.5 feet. This guy still has some growing to do. Jim Watson. Chris and I stuck around in eastern Washington, but the rest of the weekend was just icing on the cake compared to helping Jim and Alasdair with the golden eagles. Jim got in touch Tuesday to let us know both eagles have fledged. Those young birds are soaring over cliffs and hillsides, learning to hunt, and one day hopefully building eyries of their own. One thing is for sure - if I was on the fence before, but I am definitely a bird nerd now. The author having a really, really good day.